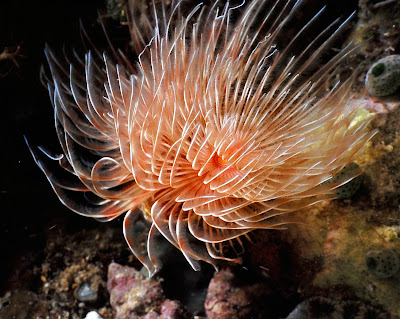 Meet the Coco Worm, a spectacular annelid from shallow, Indo-Pacifc waters. It's a tube worm, so it lives within a tough, calcareous tube that can reach 20 cm (8 in) long but is only about 1 cm (half an inch) across. The actual worm lives inside, safe, secure and hidden away in its long, winding corridor. But then it gets hungry. They're not so hidden when they're hungry! Coco Worms positively bloom as a pair of bright orange spirals emerge from the mouth of their tube. It's an arrangement of feathery tentacles which capture tiny plankton for eating. The Coco Worm goes by several other names, including Red Fanworm, Magnificent Duster and Mopworm. If your New Year's resolution happens to involve looking fabulous when you do the housework, then a Magnificent Duster is a good place to start. Prettiest tentacles on the block!